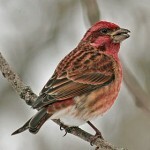 Kitten-like “tee-yee.” Song is somewhat similar to that of American Goldfinch. Description: Lacks white undertail coverts. 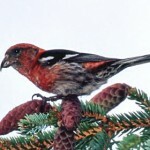 Adult male has entirely black crown; back varies in color from black in eastern part of range to greenish in western birds. Underparts are bright yellow; white markings on black wings and tail. Females are duller overall and lack black on head and back. 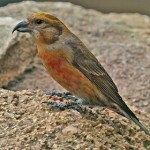 Juveniles are similar to adult females. Behavior: Lesser Goldfinches often combine their own call notes with those of nearby species. Habitat: Oak savannas, dry brushy fields, woodland edges, and suburban gardens. Where in Nebraska: Accidental. Seen in Sioux County in 1984, and at Cedar Point Biological Station in Keith County in 1998. 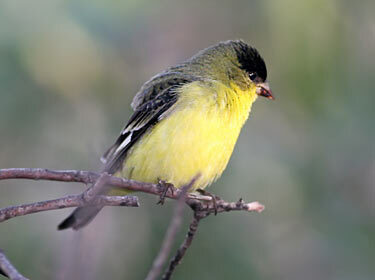 Fun Facts: Field Notes: Lesser Goldfinch males have black caps and blacker backs in the East and greener backs towards the West.